The Book of Dirt is a love story, a riveting survivors' tale, and a grandson’s quest to learn about his grandparents' extraordinary lives. The author’s family built myths around them: Jakub was a teacher in the camps, keeping the children busy until it was their turn to be killed; Dasa laid the railway sleepers on the tracks that brought her fellow Jews to their deaths. When they died, their stories went with them. Then came the cracks. Everything the author thought he knew was wrong. In this story of two unlikely survivors, Bram Presser brilliantly imagines the fate of Jakub, deported to Auschwitz and to Theresienstadt, where it was rumoured after the war that he had sorted through thousands of Jewish texts confiscated for a so-called Nazi Museum of the Extinct Race. The Book of Dirt is also the story of Frantiska, her fraught marriage in Prague, and how she and her two eldest daughters, Dasa and Irena, miraculously survived the camps. 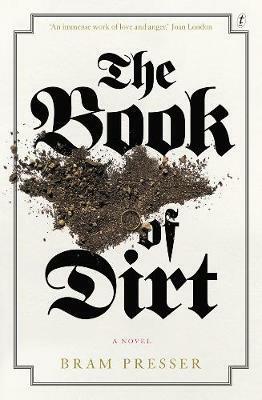 The Book of Dirt is a completely original, page-turning novel about family myths and Jewish myths. And it is a heart-warming story about a grandson’s devotion to the power of writing, storytelling and his family’s legacy. Armed with a complex cast who fictionalise the gaps in memory that have forever been erased, Presser follows his own cautionary edict. The bulk of the novel seeks to understand his grandfather, Jakub Rand, a victim of the death march to Sachenhausen in April 1945. Prior to this, Rand had been forced to work in the Museum of the Extinct Race in Nazi Germany. Told through prose, myths, letters, emails and photographs, these forgotten lives gain humanity and memory through Presser’s work. Works such as this give us the opportunity to grapple with complex questions of forgotten history, research and belonging. It is difficult to convey the breadth and nuance of this extraordinary work. It is a book about how history is made – and about who is allowed the privilege to remake it. There are echoes here of Sebald’s biting honesty and Chabon’s long and rewarding vignettes. An absolute pleasure to read. David Little works as a bookseller at Readings St Kilda.